Tamer graduated in Material Engineering from the German University and has been working as a Corrosion engineer in a local engineering company in Cairo since 2010. 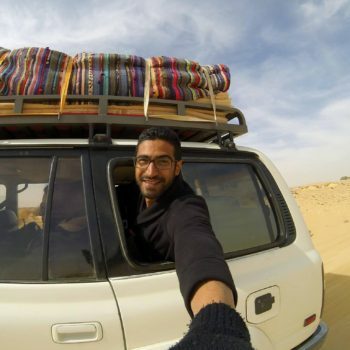 Since his last year at college he has worked as a part-time Tour leader in a local travel agency, where he had the chance to discover a lot about Egypt and meet a lot of new people. In July 2012 he started an awareness campaign called ‘امشي في حارتك’ which means “Drive in Your Lane” aiming to reduce a major traffic problem in Egypt, improve the Egyptians’ driving behaviour and from there; enhance their humane side towards one another. On Tuesday the 24th of July, 2012, he made his way to the 6th of October bridge with a large sign that said “Please, Stick to Your Lane!” and an orange traffic cone. He stood in the middle of the bridge, holding up the sign with the orange cone in front of him on the white line separator for about 10 minutes, and for the very first time in his life, he saw cars driving in their own lanes in the midst of the traffic. From that day on and for several years, he continued working on this project, trying to spread and enhance the idea until the media started to recognize the initiative, sharing about it in newspapers, on radio stations, TV channels spreading it to other governorates. Tamer enjoys helping people, coming up with new creative ideas and implementing these ideas, besides, photography, documenting and video production, story telling and ice-cream.